» Is This the End of the Williams Sisters Era? Perhaps it’s too early to say an era is coming to a close, but this is definitely a moment. Just a few days into the French Open, both of the Williams sisters, Venus and Serena, have been eliminated. Both losses were shocking in their own way. Serena’s first-round exit Tuesday, one of the bigger upsets in recent Grand Slam memory, was shocking because she’s Serena Williams and her opponent was the 111th-ranked Virginie Razzano. It was shocking because she was up a set and still lost in three. It was shocking because she lost a second-set tiebreaker that she had been leading 5-1. It was shocking because she got down in the third set, fought back, but then still lost. Venus’s second-round exit Wednesday was also shocking, not really because she lost (she was unseeded, facing the 3-seed Agnieszka Radwanska), but because her defeat only took one hour. She won five games and lost 12 in 60 minutes. Even though Venus is no longer the Grand Slam favorite like she once was, we’re used to her serving and hitting people off the court in an hour’s time, not the other way around. Never the other way around. Because she’s Venus. Like I said, an era ending? Maybe not. But this is most certainly a moment. While there have been stars and champions of women’s tennis in the post-Y2K world, in this time period the sport has been dominated by the package deal that is the Williams sisters. The duo made it to 21 Grand Slam finals, including eight face-offs (most notably the 2001-03 stretch where they met in six out of eight Grand Slam finals). Throughout their careers, they have alternated with regard to which one is surging (and receiving the “better Williams sister” treatment). It started with the elder Venus, breaking out in the 1997 U.S. Open at age 17, making it to the final before losing to Martina Hingis. Then the younger Serena won the tandem’s first Grand Slam, exacting revenge by ousting Hingis in the 1999 U.S. Open. Venus won back-to-back Wimbledons and U.S. Opens 2000 and 2001, but 2002 and 2003 belonged to Serena; she won five Slams (four in a row, but across two calendar years) and all, impressively, against Venus. 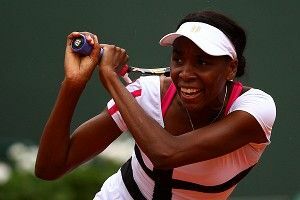 The second half of the decade saw both sisters winning, with Serena at a higher rate, but in 2008, Venus temporarily halted her sister’s success (while proving that she had plenty of game left) by beating Serena for her fifth Wimbledon title. Venus’s ousting of Serena at the 2008 Wimbledon was her last Grand Slam title, with her last finals appearance coming the following year at Wimbledon. That time, she lost to her sister. In 2010, Venus never lost before the fourth round of all four Grand Slams, but 2011 was the exact opposite — Venus never made it past the fourth round. After Serena’s 2009 Wimbledon win against her sister, she went on to win two Slams in 2010 and was the runner-up to Sam Stosur in last year’s U.S. Open. Even with more recent success than her sister (and her Slams total now at 17 versus her sister’s 14), 2011 marked the first year that Serena hadn’t won a Slam since 2006. And with her first-round exit Tuesday, she’s halfway to her first two-year stretch without a Grand Slam victory in more than a decade. It might be more than a moment. This could definitely be the end of an era. Or at least, it could be the first sign that the end is near.